DIYARBAKIR / AMED—As part of the Global Sur and Hasankeyf Action Day in almost 30 cities, actions have been organized on 28 April 2018. Activists and civil organization raised awareness on the ongoing destruction of the two antique cities Sur and Hasankeyf at the Tigris River in North (Turkish) Kurdistan. In the last years Sur and Hasankeyf have become synonyms for the repressive and exploitative policy of the Turkish government against nature, culture and people. The 12,000-year-old town Hasankeyf and the surrounding Tigris Valley are threatened by the Mega-Dam Ilisu Dam, under construction, which is one of the most-controversial dam projects in the world nowadays. It would destroy the livelihoods of up to 80,000 people in North Kurdistan and probably much more in Syria, and particularly in Iraq. Sur is the old town of Diyarbakır, which has been attacked brutally by the Turkish government with military after the war in Kurdistan has restarted in summer 2015. Although part of the UNESCO World Heritage Site of Diyarbakır, the Turkish state has destroyed systematically half of Sur; 23,000 people have been displaced and a culture of thousands of years eliminated. On the morning of 28 April, dozens of activists, displaced people, NGO representatives, artists and oppositional politicians gathered in front of the Grand Mosque (Ulu Cami). Surrounded by police, they issued a statement against the ongoing destruction, which has been described as the implementation of a long-expressed aim to gentrify and change the demography of Sur. They called for an end to the destruction and a new approach with the return of displaced people to their neighborhoods. The action day continued in a courtyard of a traditional Diyarbakır house in the part of Sur that was not destroyed. 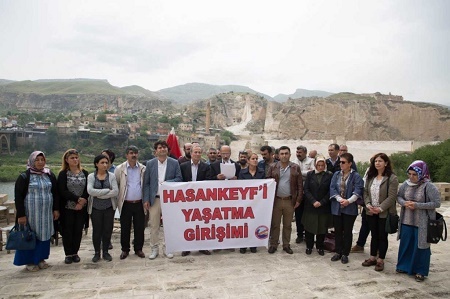 At the same time, dozens of activists, displaced people, NGO representatives and opposition politicians from Hasankeyf and Batman gathered in the city of Hasankeyf. In their statements, they criticized the ongoing destruction in the city since summer 2017 and emphasized that the resistance will continue although the dam construction has proceeded. The Ilisu Project is not wanted by the large majority of the society, who will have no benefits from that project. Rather it should be aimed to consider the Tigris River as a heritage and a medium for peace between the people of the whole basin. In the two continuously inhabited ancient cities, participants in the gatherings characterized the current policy is cultural genocide. As Sur and Hasankeyf are world heritage sites, the democratic organizations and people worldwide should raise awareness about them and act against the destruction on international level. Apart from Sur and Hasankeyf, actions have been carried out also in the cities of Urfa, Van, İstanbul, İzmir, Ankara and Antalya as an expression of solidarity in the broader society. On the international level, actions have been undertaken in more than 20 cities. Germany led with the most actions, in ten cities. The actions were diverse, ranging from demonstrations to information desks, picture exhibitions, film screenings and discussions. These actions drew out the relationship to global neoliberal and warring governments’ policies of the countries where the actions took place, as well as heavily criticized international organizations such as EU, UN and UNESCO for their responsibility. Through these actions, thousands of people have been contacted and informed in the following cities: Athens, Bilbao, Barcelona, Ribes (Catalonia) Madrid, Martigues (France), Brighton (England), London, Stockholm, Vienna, Berlin, Hamburg, Hannover, Bremen, Celle, Frankfurt, Freiburg, Karlsruhe, Regensburg and Munich. Additionally, in several Swiss cities, flyers will be distributed and speeches held at the 1 May rallies. One of the most important participation to the action day was from Iran. On 25 and 27 April, in two cities, discussions and demonstrations have been organized by groups that have been in contact with some of the solidarity organizations for years. In Iran, people are aware of the Ilisu Dam and its larger impacts that spread as far as the South of Iran. In 2017, Iranian activists mounted a strong petition to the UN, which 150,000 people signed. Do not allow destruction of settlements and nature. Let’s defend common history, nature and culture! Photo: Demonstration at Hasankeyf, 28 April 2018. Source: Hasankeyf`i Yaşatma Girişimi.